Welcome back to my blog! This time, you'll be reading all about the King's Trail in northern Sweden, officially known as the Kungsleden. It runs about 270 miles (440 km) between Hemavan and Abisko, and this time I'll be traveling with Karolina who you last saw hiking with me on the John Muir Trail a couple of years ago. With the uncertainties of stand-by travel, I flew out a few days early and Karolina showed me around her town of Leeuwarden in the Netherlands. She took me on a walking tour of some nearby mudflats where we wound up hiking through knee-deep mud and it was important to finish before the tide came in and drowned everyone. More relevant, we also stopped at a sporting goods store for me to buy a few items for the trail. I was heading to Sweden--not an area known for its high temperatures! And not just anywhere in Sweden, but northern Sweden and above the Arctic Circle! Nights, I expected, might get a little cold. And I stupidly forgot to bring my long underwear from the states, so I went on a shopping trip to pick some up. And finally, it was time to... travel. Getting to the Kungsleden Trail isn't easy and is an adventure in its own right. 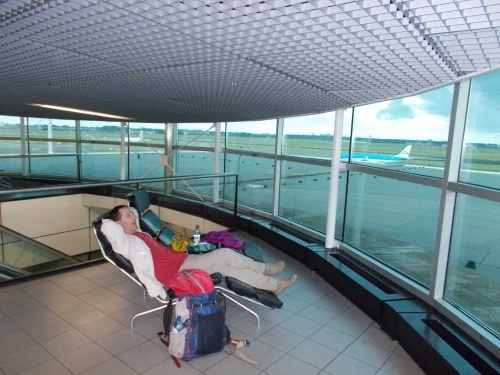 Karolina and I boarded a trail to the Amsterdam airport, which took a couple of hours and was non-eventful. We arrived at the airport early as all good travelers should do, but in our case, we arrived a little too early because our airline (Norwegian) wasn't checking in people for our flight yet, so we headed to a nearly Burger King for lunch/dinner and to kill an hour before it was time to check in. We checked in, checked our bags, and were soon in the air flying off to Sweden. I'd never been to Sweden before so I was a little excited to see what surprises the country would throw at me. I relax waiting for our flight to Sweden. The flight wasn't particularly long--maybe two hours, as I recall--and we didn't even change time zones--but the flight was running late and we didn't actually land at the Stockholm airport until shortly after midnight. We stepped out of the plane and took our first steps in Sweden. Well, it was my first steps in Sweden. Karolina had been in the country years before, the world traveler that she is. But it was her first steps for this trip! We picked up our bags which made it through the baggage machinery unscathed, then found a kiosk with travel information. Our ride wouldn't leave for several hours--Karolina had done the research earlier and figured out that we could take a train into Stockholm, then transfer for a very long ride to the trail, but when we looked up the details on the kiosk, the ride was missing! She wasn't sure what happened. Did she look up the schedule for the wrong day? Did the schedule change? In any case, our ride to the trail didn't exist. 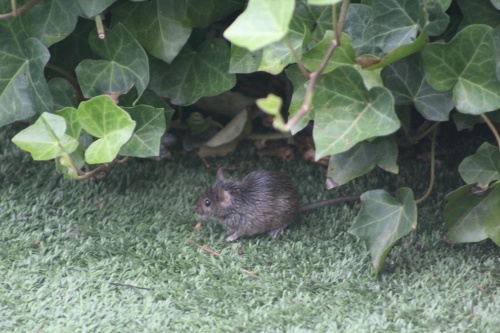 The only wildlife we saw--so far--was this mouse scurrying around at the Amsterdam airport. So we started investigating exactly how we would get to the trail. We planned to hike from south to north, starting in Hemavan. 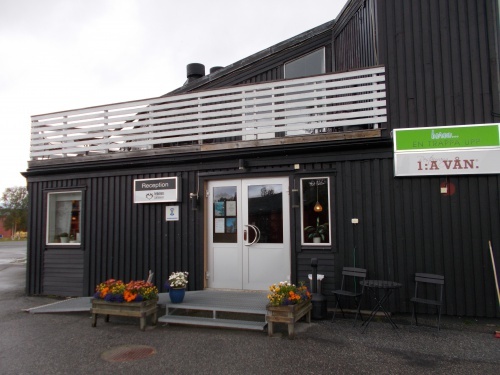 Using Google, I found a route that would land us on a 6 hour train ride to Umeå where we would have a 1.5 hour layover, then another 6 hour bus ride to Hemavan. Ugh! It's not easy getting to Hemavan, and that's the southern terminus of the trail. The northern terminus is even further away! With Karolina's original plan, we would have arrived in Hemavan in the early afternoon with plenty of time to shop for groceries on the trail, grab dinner and relax before starting the trail the next day. With our latest plan, we wouldn't arrive in town until nearly 8:00 PM--when most places close for the night already. But it was the best and fastest option available. But we still had to wait nearly six hours before our train arrived, and much to Karolina's surprise, we didn't actually have to go into the city of Stockholm to catch it. 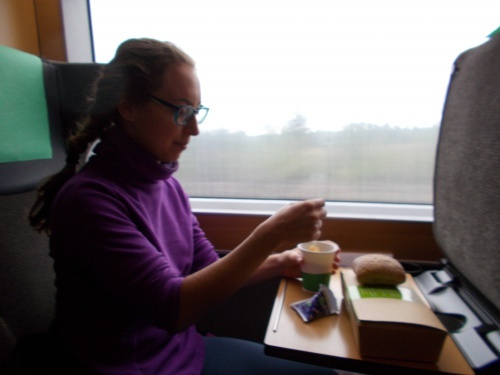 Our train started in Stockholm, then headed north stopping at the airport along the way. I wondered if I was the first tourist to ever visit Sweden and not actually see Stockholm. It just wasn't on the way. 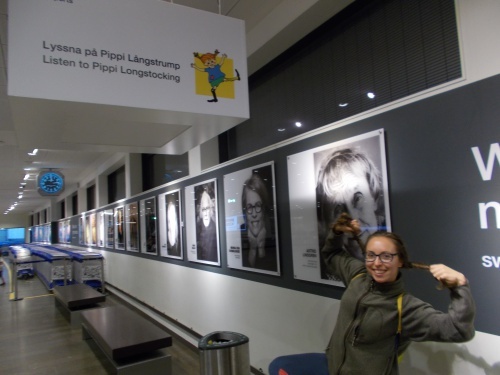 This wall had photos of famous Swedish people, but Karolina got very excited about Astrid Lindgren, the woman who wrote Pippi Longstocking. I set an alarm to make sure we'd be up in time to catch the necessary train. If we somehow missed it, the bus that we wanted to catch didn't run the next day and we'd really be screwed. It might take a couple of extra days to get to Hemavan if we missed either the train or the bus! After a few hours of fitful sleeping, we headed down to the train station located deep underground and waited for our train which arrived a minute or two late and had me worrying that maybe the train that arrived a couple of minutes before the scheduled time was really our train and the one we were supposed to be on. But no, our train was only a minute or two late and we got on the correct one. We found our seats, and an attendant soon served us a cheap breakfast like that an airline might have served, but we were hungry and happy to eat everything they gave us. Our first-class seats provided outlets, so I plugged in my laptop and did some work on Walking 4 Fun. There was a wi-fi signal available on the train, but it wasn't always reliable so I didn't use it much. Mostly, I worked on the videos for Walking 4 Fun which I could do offline and upload later. The train ride was the best and most comfortable part of our long journey. Here, Karolina is enjoying the provided breakfast. And about six hours later, we finally arrived at the end of the line in the town of Umeå. It's a town that I hadn't heard of until after we already landed in Sweden, and I had quickly downloaded maps of the town to my smartphone so we could find our way around for the 1 1/2 layover we had. Our first stop was at a nearby Subway for lunch and a place to drop our heavy luggage while waiting for our bus. We both ordered the sandwich-of-the-day, which I now forget what it was, but it cost something like 35 kronas--or about $3.50 which I thought was quite reasonable. The exchange rate was about 9 kronas (or SEK) to 1 US dollar, but it was easier to just divide all prices by 10 in my head to get a ballpark idea of how much I was paying for stuff. I had been a little concerned that Sweden might bankrupt me after hearing horror stories about how expensive the country is, but it wasn't anything near as bad as I had feared. It didn't take long to eat lunch, so we took turns going for a short walk to check out the grocery store and look around a bit. I went first while Karolina watched my gear, then after I returned I watched her gear while she went to a nearby grocery store. But eventually it was time to catch our bus, so we headed to the bus station and a short while later, boarded our bus. This was definitely the worst part of the trip. The bus was packed with people and the seats were cramped. And shockingly--despite being trapped on the bus for 6 solid hours--there were no restrooms on the bus. Fortunately, neither of us had much to drink, and both of us pretty much stopped drinking during the entire bus ride. By the end of the ride, however, we were both getting a little desperate for a bathroom! We arrived in Hemavan near 8:00pm--it had been a long, miserable day of travel--and although the day had been sunny and beautiful, it started sprinkling almost immediately upon stepping out of the bus. Ugh! We both used the bathrooms at the wrong place, too desperate to wait until we got to the right hostel, but headed back out into the rain to walk to the correct hostel. We walked completely around the hostel looking for the reception desk, stupidly following signs leading vehicles through their maze of a parking lot. We checked in and dropped our stuff off but immediately went out again hoping to get to the local supermarket before it closed for the night. The supermarket was scheduled to close in another half hour so we made it, but not with a whole lot of time to spare! We bought some food for dinner which we took to our room to eat, then headed to sleep. We were both exhausted--and we had a trail to start hiking tomorrow! Looking forward to following this adventure too. Was surprised to see it pop up in my list today. 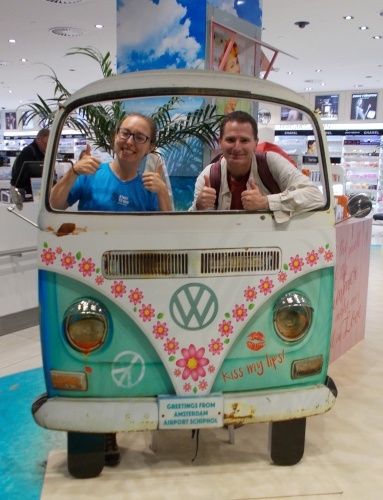 "Karolina and I boarded a trail to the Amsterdam airport, which took a couple of hours and was non-eventful." Not to be picky...do you mean you boarded a train? So excited about this trail! Sweden!